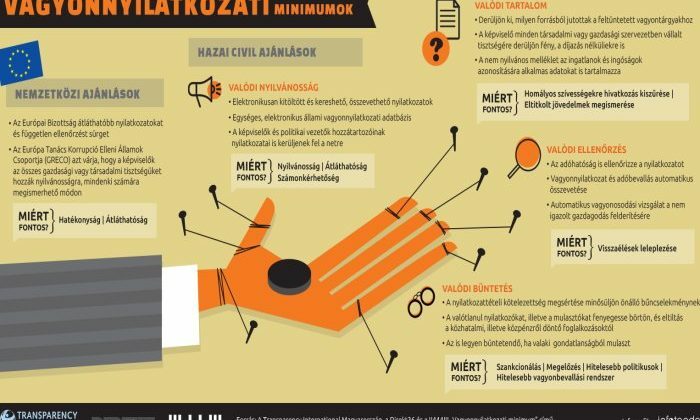 Currently there is no possible to continuously keep track of the enrichment of decision-makers with public power as the relevant laws in Hungary do not guarantee this to the general public. Today’s system of asset-declaration cannot ensure the transparency of the enrichment of people with public power. The citizens rightfully expect that elected officials and other civil servants, whose salaries come from taxes, have to account for the origin of their wealth. The applicable laws on asset-declaration do not ensure this. The declarations are not disclosed in every instance and the declaration of relatives remain undisclosed, while the inspection of the content is merely a formality and the person filling out the declaration with false, untrue information is not sanctioned dissuasively. a.) Instead of handwritten and scanned declarations, declarations should be digitally recorded, digitally readable and should come in a searchable, comparable format. b.) Standard, electronic, and state controlled database of assets declarations, in which every declaration (and modification) made during the mandate of an official can be found. c.) In the case of Members of Parliament and political leaders (ministers, under- secretaries) the asset-declarations of their relatives (living in the same household) should be made public and accessible on the web. a.) The declaration should contain an explanation on the source of the official’s funds, properties, valuables, etc. b.) The declaration should contain the MPs every office he/she holds in any organization, even if it is not a position with remuneration. c.) The undisclosed appendix of the declaration should contain information on the movable and immovable property listed in the declaration. This information can only be accessed by the authorities and the parliamentary Committee of Immunity. a.) The declarations should be audited by the tax office. b.) Asset-declarations and tax returns should be compared automatically. c.) Automatic wealth gain investigation in case of inexplicable enrichment. a.) The Penal Code should determine the violation of one’s obligation to publish their asset declaration as a separate offense. b.) Those who do not present or provide false information within their asset declaration should be sentenced to prison time and their right to enter positions of public power and the handling of public funds should be suspended. c.) The cases where individuals miss or violate their obligation to publish their asset-declarations due to negligence should be punishable too. The Vagyonkereső (a project of Direkt36, created with the contribution of 444.hu and Transparency International Hungary) is a continuously updated databank where you can look up the asset-declaration of Members of Parliament, you can download an original copy, and the blog on the main page collects news about asset declarations.